Enter the phrase “Kelly Mitchum Pinehurst 3 putt” in a Google search box and in 0.93 seconds you’ll get 3,140 results. PGA.com anointed Mitchum a “magician.” He’s been fêted on CBSSports.com and on The Golf Channel’s Morning Drive program and given a cyber pat-on-the-back by noted golf blogger Geoff Shackelford. “It’s been pretty amazing,” says Mitchum, a longtime instructor in the Pinehurst Golf Academy. They say everyone has his 15 minutes of fame. Mitchum’s had a dose of golf fame in qualifying four times for the PGA Championship, one of golf’s four “majors,” while holding down a full-time job at Pinehurst. Now his fame is taking a wholly different presence with a 20-second, self-produced video posted July 10 on Pinehurst.com that shows Mitchum executing a “trick shot” on a practice putting green — three putts struck within one second of each other, traveling on different paths and reaching the bottom of the same hole in rapid-fire succession. What makes the feat so awe-inspiring is that the third putt hits the hole first, followed by the second, followed by the first. 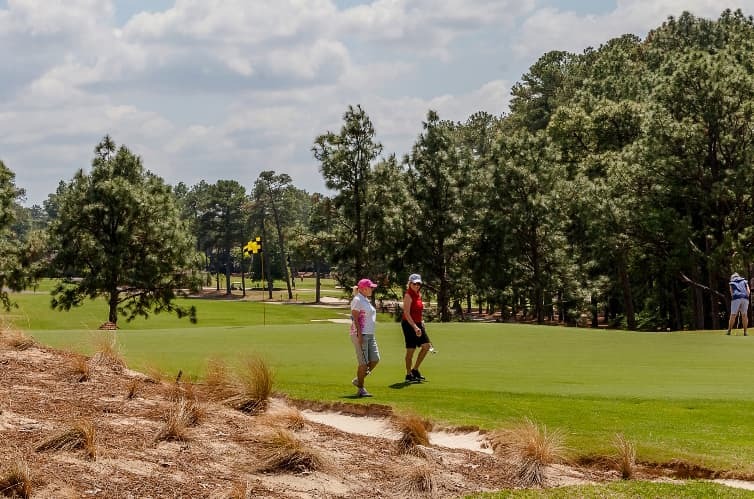 It’s the product of some imagination and skill on the part of Mitchum, 44, a former N.C. State golfer and winner of the 1993 North and South Amateur. And it’s a product as well of today’s social-media conscious world that gobbles up short and sweet bits of content like M&Ms. By December, the Mitchum clip on YouTube had nearly 700,000 views. A Vine posting had registered more than 1.2 million “loops,” as they’re known on the site comprised of 6-second video clips. The “news” page of the Pinehurst website where the Mitchum video is housed has generated some 800,000 views. “It’s been remarkable,” says Alex Podlogar, Pinehurst’s content and media relations manager. “Every time you think it’s reached a saturation point, it gets a new life and more people find it and start sharing it all over again. Mitchum has taught in the Pinehurst Golf Academy since 1997 and in recent years has developed a set of “playing cards” under the EPIC name (Engaged Practice in Challenges) that seek to enliven practice by giving golfers challenges—make so many 6-foot putts in a row, try getting up-and-down from random spots around a green, imagine hitting 6-irons to a flag bordered by a lake. The fact that putting practice can be boring and the proliferation of trick-shot videos from golfers like the Bryan Brothers prompted Mitchum this spring to dream up a putting challenge. Early in the summer, Mitchum began toying with the idea of striking three putts from the same location and having them reach the cup in reverse order. He began experimenting during lunch and down time on the practice green at the Golf Academy. He picked a right-to-left putt of about 20 feet, and the first hurdle was to figure out how high and easy he could strike the first ball. Then it was a matter of mounting his iPad on a tripod, setting the camera to record and trying to turn the trick. He doesn’t know how many times he struck the series of three putts before getting them to ring the bell, but he does know he had about an hour of video time before the winning “trifecta” was struck. “There’s no way to improve on the last one. Why ruin it?” he says. And yes, he’s got a sequel in the works. But Mitchum is not saying what or when. “Anything good like that, it takes time,” he says. Stay tuned, but you won’t have to look too hard. In today’s world of social media, the good stuff travels fast. Lee Pace is a regular contributor to the Pinehurst Blog. He latest book, “The Golden Age of Pinehurst—The Rebirth of No. 2,” is available in all retail shops and online at Pinehurst.